Hello and welcome to my blog; today I am sharing my project for this month's One Stamp At a Time Blog Hop. 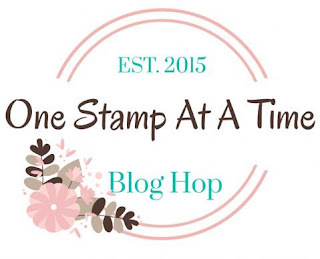 This month's theme is about Simple Stamping. 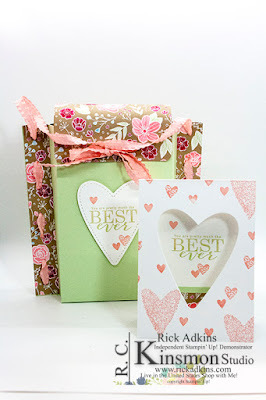 For my projects today I picked the All Adorned Stamp Set (a 2nd Release Saleabration Item) and the Meant to Be Stamp Set (from the Occasions Catalog) along with the matching Be Mine Stitched Framelits. Here's a look at my projects. I started by creating the base of my card. I used one of the large stitched hearts from the Be Mine Stitched Framelits and cut out a heart out of the 4 1/4 x 11 thick whisper white cardstock that I planned to use as my card base. 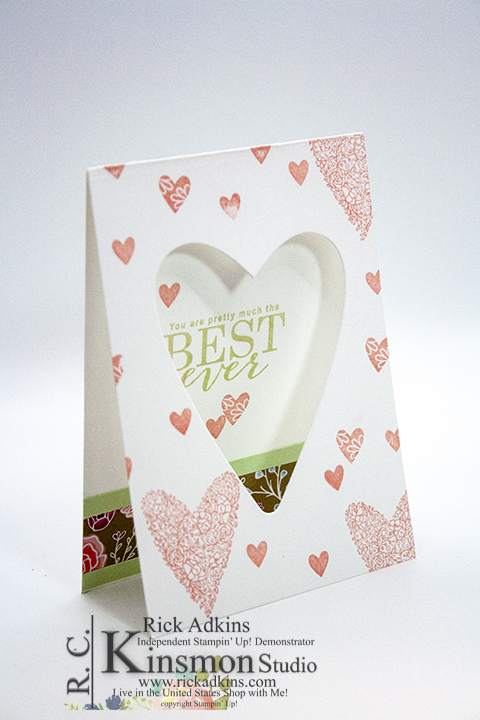 I stamped the out side of the card using three of the heart stamps from the Meant to Be Cling Stamp Set. Next I closed the card and stamped the sentiment from the All Adorned Stamp Set in the center of the heart opening. I varied the sizes of the hearts along with the placement so that it would draw the eye around the card and create interest. For the inside of the card I added a strip of the All My Love Designer Series paper and two 1/4" strips of Soft Sea Foam cardstock. These little touches help to tie in the paper and color of the gift bag. Here's a closer look at the inside. For the 3d project this month I created a stitched gift bag. This gift bag looks a lot harder then it really is. 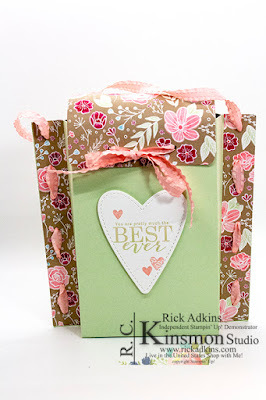 This gift bag is actually very simple to create but looks so much harder than it is. Here's a look at the gift bag. This is a medium version of the gift bag and uses to pieces of cardstock along with some designer series paper. I recycled the stitched heart from the card base and used it on the front of the bag. 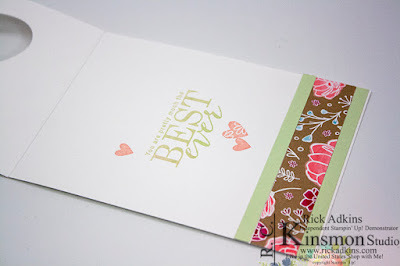 I repeated the same stamping from the inside of the card. During my Facebook Live last night I shared how to create a smaller version of the stitched gift bag. You can watch the video below about how I created the bag. The smaller version in the video only uses one sheet of cardstock. Thanks for dropping bye today, You can go to the next blog by clicking on the name in the link list below. You can pick up the supplies I used today in my online store 24/7. 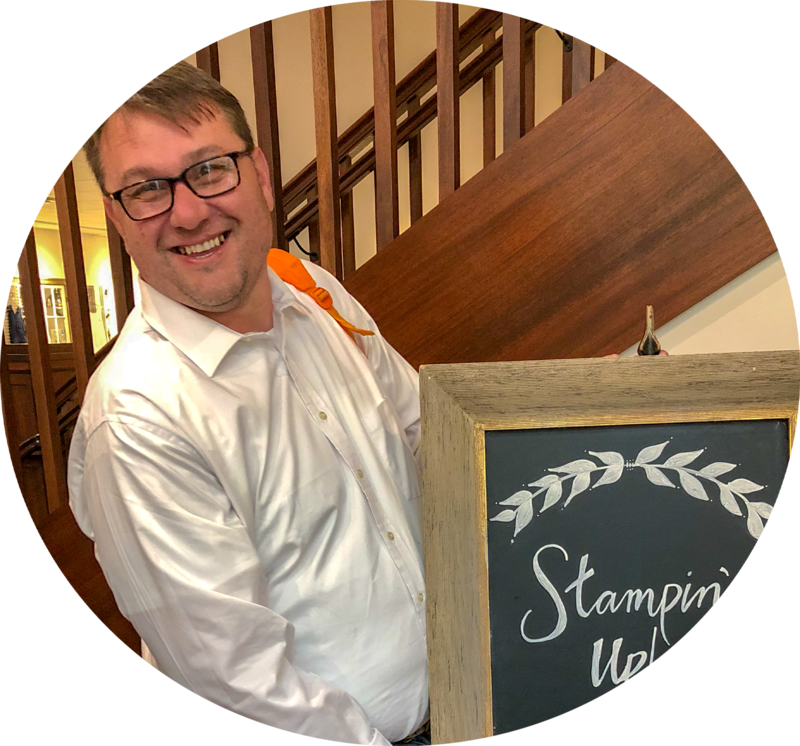 Labels: stampin' up!, crafts, cardmaking All Adorned stamp set, Be Mine Stitched Framelits, Gift Bag, Meant to be stamp set, rick Adkins, Stampin' Up! 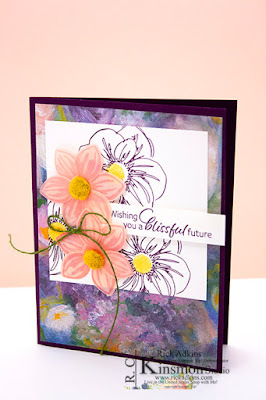 Love the simple outside and the surprise of the designer paper on the inside of your card. This is lovely Rick! I love the heart window and that sentiment is perfect here! Beautiful card and project Rick!